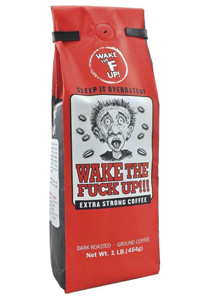 I ordered the Wake the F- Up coffee partially as a joke, but it won over the coffee drinkers in the house and we will definitely order more. Would appreciate a whole bean option. Dec 17, 2018 | By m.s. I've been telling everybody about this it does what it says. The first thing I go for in the morning. I love it!!!! I gave this as a gift to someone that lives on coffee. She loved it! Got this from a friend and laughed at the name but was impressed by the coffee. Great flavor! I love it and when I ran out had to find more! I'm on my second lb of the stuff. Add ghost pepper flakes for an insane heat factor. Lives up to its name for sure! Not sure if 1 is good or 5 is good because the rating scale is not appearing, but I gave it a 5 for excellent. This is a gift for a friend of mine, and originally I was sent the incorrect product. Your customer service is exceptional, though, and the correct product arrived quickly and with an apology! Thank you for that! I will definitely order more product from you! Our entire family enjoyed this coffee.